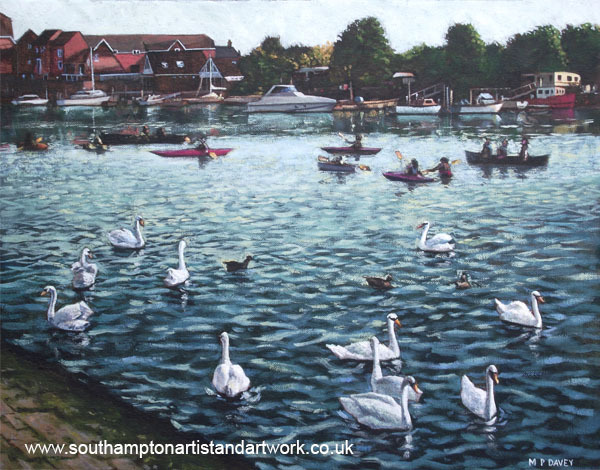 Plenty of swans can be seen on the featured river, known as the River Itchen. The water still has a large salt content at this stage and many sea birds can be seen as well as fresh water varieties. The area is popular with canoeists and yachtsmen using the water, and families and friends walking through the park or fishing from the banks of the River Itchen. The painting is based on a number of poor quality mobile phone images, taken during a summer evening. A complete composition is built up in photoshop and then redrawn on the canvas.